IL TEMPIO DELLA CHIANINA - Lungarno 23 è il locale a Firenze dove è possibile gustare autentici e sani hamburgers di Chianina toscana fatti solo con carni direttamente provenienti dagli allevamenti in zona di origine. FILIERA CORTA - La carne Chianina (IGP) arriva sulla vostra tavola, insieme ad altri prodotti da noi selezionati, secondo una cortissima filiera produttiva e distributiva, che mira ad offrire un prodotto dalle origini antiche, oggi riproposto secondo una moderna concezione. FILOSOFIA KM0 - Lungarno 23: prodotti che traggono origine dalla tradizione gastronomica toscana, esclusivamente selezionati presso piccole realtà imprenditoriali, secondo la logica della massima riduzione dei passaggi nel trasferimento degli alimenti che si interpongono tra il produttore ed il consumatore. Sempre una certezza, hamburger top! Ottimo hamburger con avocado ! Un buon posto dove gustare un hamburger di qualità. Food was excellent! Went here with my wife as part of celebration of our recent marriage. Once seated we were served each a glass of delicious Prosecco. In addition, the waiter brought us a dish of house-made sushi (using the Chianina beef) that was delicious. Everything from the burgers to the cheesecake to the bottle of Chianti to the decor/ambience was superb. As we have been honeymooning in Italy for going on two weeks, this was an excellent change of pace from the pasta and pizza galore we’ve been enjoying. My Italian is poor and waiter had no issue understanding my English. Highly recommend! We had a good hamburger Lungarno 23. Enjoyed the relaxed atmosphere right on the river. Excellent burgers, courteous, friendly and prompt waitstaff and delightful atmposphere. Great wine selection. We love a good gourmet burger and we like our beef medium rare, however the centre of both or our burgers were still raw. My boyfriend likes beef tartar however we didn't want our burgers raw. Really great food, great service and hospitality. My "go-to" for high quality burgers. If you love red meat in all forms this place is for you. I had th plate with the roast beef, raw beef, beef tartare, and the small burger; I can easily say it is the best burger I have ever had. I would eat this every day if I could. Great efficient service, friendly staff. A place I keep coming back to on my visits to Firenze. And of course the food is tremendous. I enjoy the daily menus that are always full of interesting new takes on premium hamburgers with an Italian twist and regional ingredients. A fantastic restaurant that serves amazing burgers sourced from their farm. Friendly and warm welcoming atmospere. So good we ate there twice during our one week holiday. We are tourists from Germanz got used to a different type of service. Though for those who would like to experience real Italian evening in a restaurant should definitely try Lungarno23. The service is friendly and talkative, visitors are natives (I guess we were the only tourists there), guests are noisy, but I consider this as typical Italian. The price at the end pleasantly surprised us. A glass of wile 5 Euro, Carpaccio with a salad 16 Euros, Espresso 2 Euros. 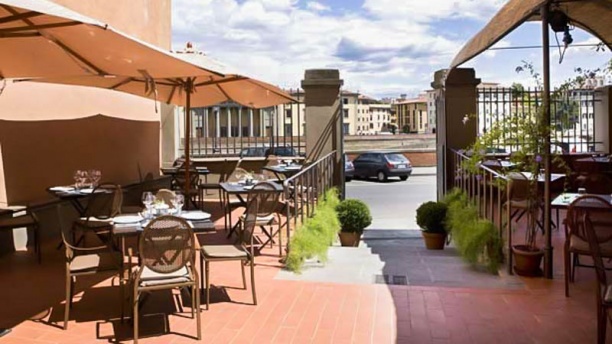 We would definitely recommend this restaurant to those who wants to feel Florence from inside.